Although half of the world is doing business online, trade shows and exhibitions continue to be a profitable business. And the only opportunity some sectors have to meet with their international counterparts. Before hiring a stand management company, you should do some research in order to save money. Make sure you are hiring the best suppliers in town. Web services like www.nstands.com give you a useful service where you can compare fees and services included. This service comes in very handy - especially when you are organizing a trade show overseas where you have no idea about the supplier´s quality or pricing policy. Once you´ve done your research and hired the (hopefully) best company in town, you now have to focus on the stand decoration, placement and set-up (this relies a little bit on point 1 since these details should have been arranged previously with the company when signing the contract). Take a look also at the attendants and try to plan a business strategy to reach for potential clients/providers you might want to get in touch with, because after all, isn´t this the real point of trade shows? 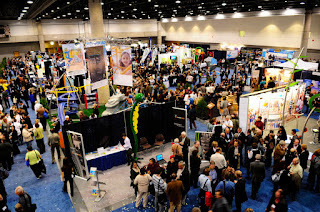 It’s better to attend a trade show with someone because every minute you leave your stand alone is a minute you are stopping doing business and connecting with potential clients. You must try to keep someone on your stand all day long because leaving it unattended will cost you bucks. Although you should try to be as comfortable as possible, you should take care of you and your partner looks, remember you are the face of your brand in the trade show and a scruffy – looking salesman has already lost half of its sale. Although it might seem obvious for some, an empty cup of coffee or a bitten sandwich in your stand table can make a terrible impression, try to keep a clean crumble-free table. Unless you are Google or Nike trade shows can be very boring at some points, you must try to keep active during the events because nothing is worse than seeing someone yawning or looking bored at an event. Try to “train” your eye to spot real potential clients and dismiss time-wasters; although you can not be rude to anyone at the show keep in mind that not all visitors to your stand are worth the effort, so save your efforts and speech for those you might get a chance with.